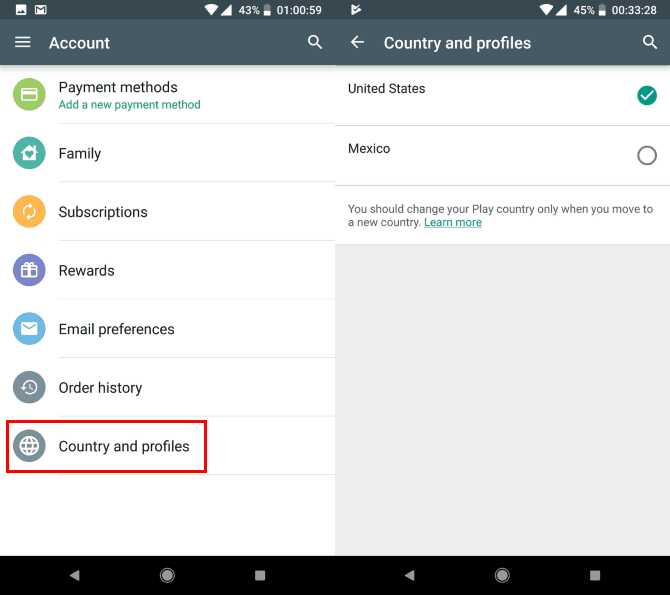 How to Change Country/Region in Google Play Store? Android is one of the most used smartphone OS in the world. Android was launched by Google back in 2008 as a competitor to Apple’s iOS. A big difference between iOS and Android is that Android can be licensed by any company for a fee, a model that helped Microsoft make immense profits in the PC industry. While there are many important features of using Android, none can be compared to the revolution brought on by the Google Play Store. The life and soul of Android OS, Play Store allows users to search for and download their favorite apps on any Android-powered device. When comparing the number of apps listed on the platform, Play Store ranks much higher than either Apple Store, or any other application store on the web. After reaching the milestone of a million listed apps in July 2013, Google Play Store continued to grow even further. It now has over 3.6 million apps listed on its store! Though the Google Play Store is the largest app store in the market, it doesn’t mean that you can download any application of your choice on your Android device. The world today is filled with multiple restrictions and censorships. These extend to online streaming channels, popular gaming titles, as well as many apps available on app stores. When you search for apps such as BBC iPlayer, Hotstar, or Spotify, they will only appear in certain regions and won’t even show on your store if you live anywhere else. Restrictions like these are the biggest hurdle to online freedom. Fortunately, these and many more restrictions on the web can be avoided with the help of a VPN. How to change your location on Google Play Store? Using Google Play Store is simple: you open the store, search for an app, and install it on your device. It’s one of the most convenient ways to download an application on any device. But what would happen if you move to a different country? You will not be able to access certain apps which were previously available at your location. If you’re stuck in a situation where you can’t find your favorite app on Play Store, then you should fret not because the following steps will help you change your country setting in Google Play. Access the menu on the left and select Account. Review the warning prompt before accepting the change. Now, you’re free to browse the Play Store of that region. Before you try out this step, you should know that this option does not appear for everyone. While these steps are pretty easy, they get more complex in the background. Before showing you the option to change countries, Google first checks up on your IP address to determine your actual location. So this is only recommended if you plan on using this location for at least a year. How to change your IP address to access apps from another country? You may have noticed that Play Store checks up on your IP location before showing you the option to change countries. This option won’t work if you haven’t moved countries. So what should you do if you haven’t moved countries but still want to access certain apps from another location? The answer is simple, use a VPN! A VPN changes your IP location from your current locality to the one of your choice. It changes your IP address, which changes your virtual location to any place of your choice. This allows you to access any content on the web, regardless of your actual location or any censorships in your country. In order to take full advantage of the location changing feature, you need to connect with a VPN with servers in the most number of countries. As of now, PureVPN possesses one of the largest server networks so users can change their IP location to anywhere. PureVPN has got over 2,000+ servers in over 140 countries. You can connect to any of these countries and download any app of your choice from Google Play Store. PureVPN has got plenty of other use-cases as well. The VPN provider is renowned for providing the best online security and privacy to its users. In a world where hacking and online surveillance is pretty common, you can use PureVPN to safeguard your online communications with the help of encrypted tunneling protocols. Now that you know about the immense benefits of using PureVPN, we suggest that you connect to the VPN provider now and download your favorite apps with ease from Google Play Store.